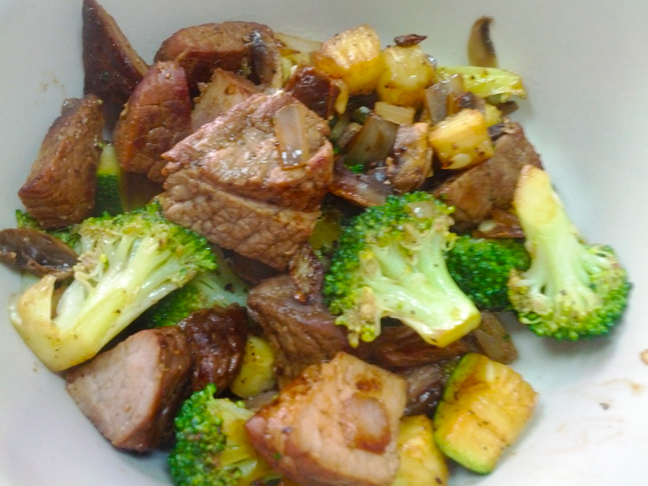 Blobmosis: Stir fry beef with soy sauce. Stir fry beef with soy sauce. Grab some cubed beef from the meat section (or grab a cut of meat and cube it yourself). I usually get 500 grams at a time (17 ounces) and cook the whole lot for the 2 of us and then save the rest for a couple of lunches or have it for dinner the following night. If the beef cubes are huge I suggest cutting them in half, or just use a similar amount of beef strips... whatever. Roughly chop up a whole capsicum (bell pepper) and toss in to the hot pan. *optional: add a half a brown onion roughly chopped at this point too. Toss around occasionally until the capsicum starts to brown. In between tossing duties, crack some pepper over the beef, sprinkle paprika and garlic powder on as well. Once capsicum is brown throw the meat into the pan as well. Let the meat brown a on all sides then add a splash of soy sauce and toss well. Add a half cup of water and simmer until all the liquid is almost gone. Divide up in to 4 serves and serve with Monster salad.